Stylish and strong, this chrome-finished tub shower faucet from Delta makes a great choice for any bathroom. It also comes with a stylish lever handle that gives you quick-and-easy control over water flow and heat. Delta Monitor<sup>®</sup> faucets feature exclusive pressure balance valves to keep water temperature within a safe ±3.6° F (±1.7° C), protecting you from sudden changes in hot or cold water pressure. This stainless steel tub shower faucet from Delta puts together modern style and all-around use into one great piece, perfect for any bathroom. Adjust its 5 spray settings to meet your own shower needs. It also comes with a stylish lever handle that gives you quick-and-easy control over water flow and heat. 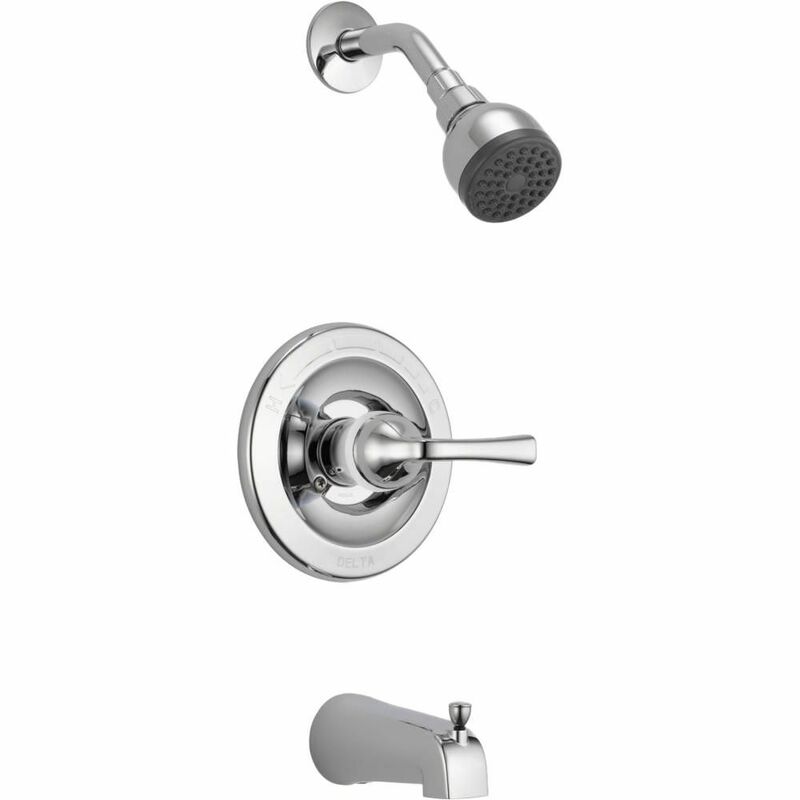 Enjoy your bath or shower for as long as you like with the Delta tub shower faucet in chrome. Easily adjust its 3 spray settings to your standards and enjoy a perfect shower every time. Use the faucet's lever handle to shift water temperature to just how you like it. This chrome-finished tub shower faucet from JALO puts together modern style and all-around use into one great piece, perfect for any bathroom. This unique fixture adds style to any shower or tub. 1-Spray Tub Shower Faucet in Chrome Stylish and strong, this chrome-finished tub shower faucet from Delta makes a great choice for any bathroom. It also comes with a stylish lever handle that gives you quick-and-easy control over water flow and heat. 1-Spray Tub Shower Faucet in Chrome is rated 3.4 out of 5 by 136. Rated 1 out of 5 by JohnA from Not working properly Water comes out of both the tub spout and the shower head when it is set to run only through the spout. When setting for shower only it tuns mostly out of the shower head but still runs partially out of the tub spout. Rated 1 out of 5 by Kart from Box of cheap garbage! Stay clear Cheap cheap cheap ! I don't even know where to begin! I got this thing for free and still I got ripped off! I can't say enough bad about this thing! Horrible engineering, design and quality! Rated 1 out of 5 by Tanya J from pressure this vale and or other parts not a good worth the money. the unit has very little water pressure or volume the shower spray is bad and take for ever to fill the tub. That is if the handle does not fall off. Rated 5 out of 5 by crookster from Only the best. Always purchase Delta Products I have been purchasing Delta Products for many years. Would not even think about other faucets from another Company.